Today I had the fun of 20 Year 5 students in my classroom. 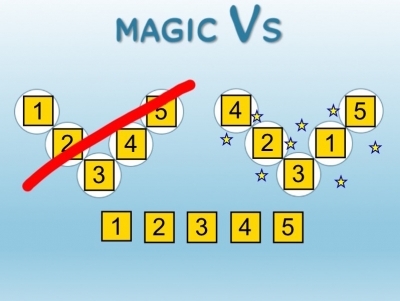 I used the Magic Vs problem from NRICH. NRICH have lots of good leading questions, solution discussions and videos. There was lots of great thinking and discussion. I made a SMART Notebook file to aid the discussions, available on MathsFaculty. I think I just found the activity for the last period on the last day of the year. Here’s a second foldable for the Preliminary (Year 11) General Mathematics course for the topic DS1 Statistics and society, data collection and sampling. This second foldable is about classifying data. For “Arts and Crafts Thursday”* we made a foldable to summarise the formula in the topic Series and Applications (Topic 7 in the NSW BOS Mathematics Syllabus). A foldable for reviewing the Rules of Differentiation. Click the preview to see the full version. Year 11 Mathematics have one of their three periods a week, last period on Fridays. Of course, they’re not highly motivated at that time. The other week, we folded parabolas, I called it “Arts and Craft Friday”. The next week, they surprised me by asking what we were doing for “Arts and Craft Friday”... I had nothing!